Many American couples view retirement as their reward for a lifetime of discipline and hard work. Finally free from the tether of the workweek, they anticipate living the rest of their years in wedded bliss. The reality is proving to be far different. 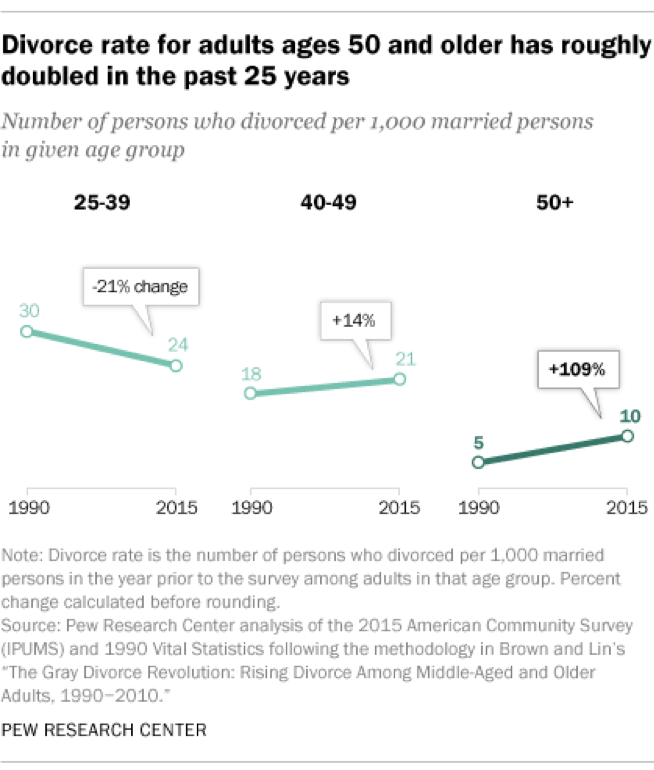 The divorce rate of adults 50 years and older has approximately doubled since the 1990s, according to a Pew Research Center report, and tripled for Boomers aged 65 years or older. The downsides of late-life or “gray divorces,” can be significantly detrimental for retirees’ health, financial well-being, and happiness. Preparing for this life stage ahead of time can help head off retirement and marriage problems before they lead to divorce. American society as a whole sometimes seems to view retirement as a carefree time of freedom, filled with travel and indulgence. Actually, retirement is a major life transition. Our identity is often wrapped up in our professional careers, particularly for men and those in leadership roles. Individuals may have a hard time adjusting to retirement if they are used to relying on that daily affirmation of self-worth. Lining up activities and community involvement before you retire can help ease the transition and minimize any feelings of loss of identity. 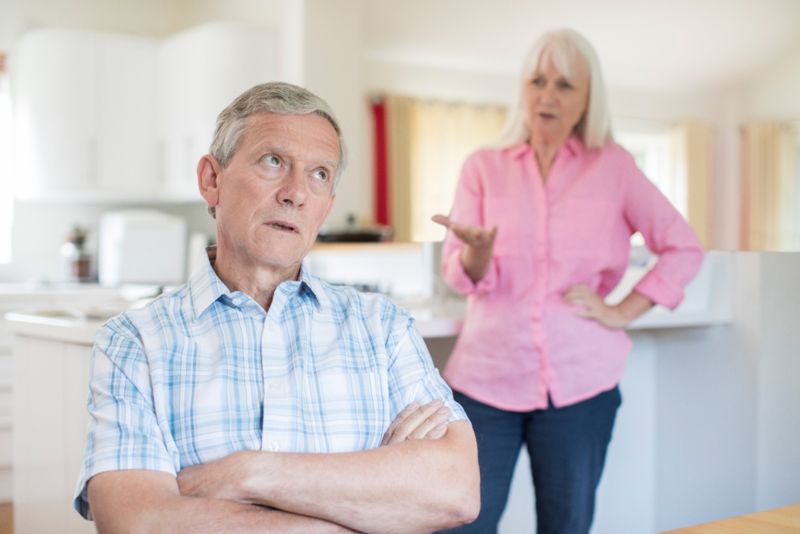 Honesty is critical when figuring out how to survive retirement with your spouse. Have an open discussion about how much time you want to spend together, and how you see your evolving roles. If one spouse has handled most home responsibilities while the other worked outside of the home, you will need to negotiate an equitable distribution of chores. Determining who will do what rather than leaving it up in the air will go a long way towards keeping the peace. 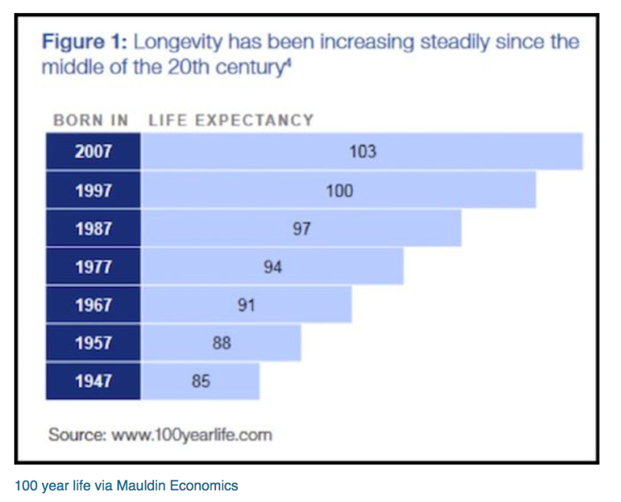 Longevity has been steadily increasing, and couples can expect to live as long as 3 decades after retiring. The prospect of sitting at home all day with no activities for years is more stressful than restful for retirees. Becoming active in your community by getting a part-time job or volunteer position will keep your mental skills sharp and help minimize feelings of isolation. One issue that can cause friction with married couples and retirement is determining when each spouse should retire. Take an honest look at your financial situation, personalities, and relationship to determine the best solution for you. 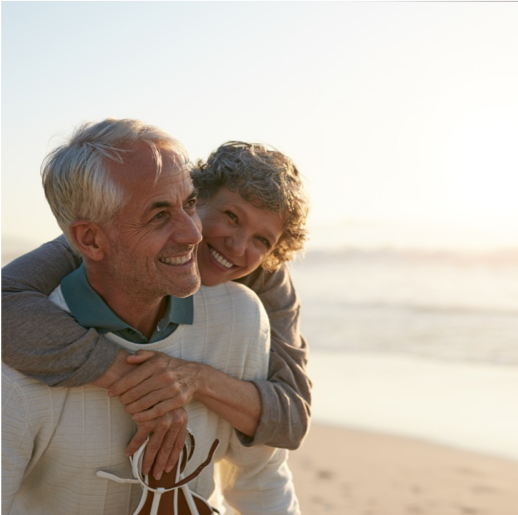 Retiring at the same time may be the right move, for instance, if your retirement plans include travel and you are close in age and work history, but it can make the transition more difficult in other ways. Retiring separately may ease some of the friction that can come from dealing with the loss of income, extra free time, and emotional impact of retiring. There may also be a significant financial benefit in having one spouse delay retirement depending on their age and time working. If you would like some help figuring out how to survive retirement with your spouse in style,financial planner Matt Logan can help. We can assess your finances and help create a savings plan to fund your retirement or make a retirement income plan to ensure you can continue to enjoy the retirement lifestyle of your choice. If you are concerned about your pension or would like help creating a retirement savings plan to ensure you can enjoy the retirement lifestyle of your choice, reach out to skilled financial planner Matt Logan today at www.MattLoganInc.com. Matt Logan is a Representative with Matt Logan Inc and Summit Brokerage and may be reached at http://www.mattloganinc.com/, 336-540-9700 or [email protected]attloganinc.com. Matt Logan Inc. is an independent firm with Securities offered through Summit Brokerage Services, Inc., Member FINRA, SIPC. Advisory services offered through Summit Financial Group Inc., a Registered Investment Advisor. Summit Brokerage Services, Inc., its affiliates and Matt Logan Inc. do not give tax or legal advice. You should consult an experienced professional regarding the tax consequences of a specific transaction. These are the views of Matt Logan Inc, and not necessarily those of Summit Brokerage Services, Inc. and any of its affiliates and should not be construed as investment advice.